It was fun to once again have New Year’s Day chocked full of must-see football games. The playoffs drew a huge TV number which we all expected. What we did not expect was just how dominant Oregon would look. 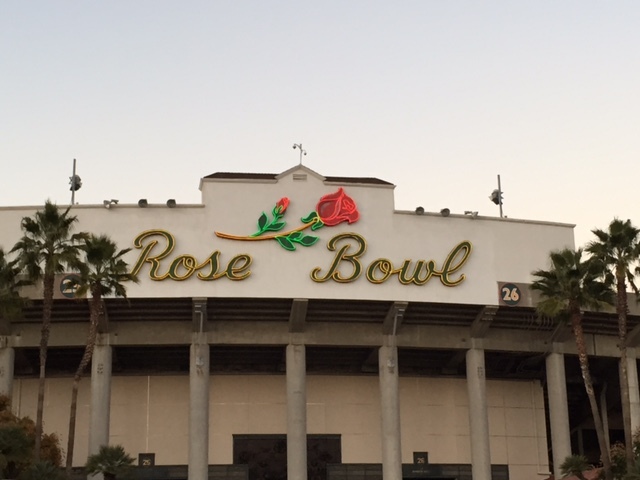 They were favored by 9 but they came out on a mission in the Rose Bowl. Oregon is as good as we thought they were. Too much speed, score too many points, and they play within themselves. Florida State was finally exposed. All those narrow victories against inferior opponents did mean something – it meant they weren’t very good. Now I will say that FSU somewhat self destructed. Their turnovers killed them. And they weren’t really Jameis Winston’s fault. Florida State didn’t really belong in that game – TCU did. Remember the voters were trending FSU down more and more each week. Instead of reversing the trend all the sudden at the last week, they should have moved FSU down to #5 or #6 and kept TCU where they were (#3) or moved them higher. Jameis Winston may be a better NFL quarterback than Marcus Mariota. He throws the ball down field more. He’s a big guy and he can move as well. Mariota is faster but a lot of that speed gets negated in the NFL. “Free Shoes University” of “Free Shellfish University” did nothing to help their decades-old Miami type image by more than half the team walking off the field without shaking hands. Again though, the villain everyone loves to hate – Jameis, did man up and shake up with everyone.